A few minutes…not hours….just minutes. That’s all it really takes sometimes to engage in meaningful play with our kids. And today I’m not talking about getting kids involved in their own independent play. Although I do strongly believe in the importance of kids exploring and playing on their own, today I’m talking about getting right in the action and playing together with our kids. Most days this comes naturally to me, but there are certainly days when chores and responsibilities can lead me to push aside that precious playtime, thinking I’m too busy and we can wait for another day. But do you know what I’ve found out? The days that I am most tempted to skip out on playtime with my kids are the days when we all need it the most. Stopping for just two minutes for a tickle fest gets us all laughing, brightens our moods, and reminds me of what’s really important on that “to do” list of mine. That’s why I am so excited to participate in the 100 Days of Play Blog Hop. From April 1st through July 9th, 100 bloggers from around the world will be sharing about the ways we join our kids in play. These will be simple activities with little or no prep needed. 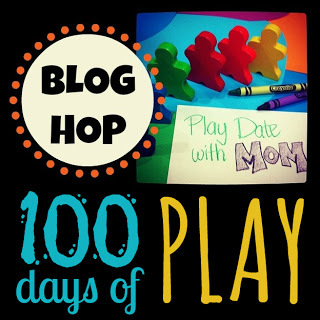 You can read a bit more about the blog hop on the 100 Days of Play page. There you will also find links to all of the participants’ posts. Chase-Every night the girls and I play chase all through the house for a couple of minutes before bath time. (Truthfully this one has gone on forever (at least in kid time), and some nights I just don’t want to…but then they laugh and shriek and it just reminds me that this will be a memory we’ll all look back on fondly. Star Gazing-This was one of my youngest daughter’s favorite rituals during the winter, but now it is not dark enough when she goes to bed. Every night after her story time we would head outside to look at the sky, sing songs, and listen for animals outside. Tickle Time-Every night after my oldest daughter’s story time, she declares, “TICKLE TIME!” It never gets old! She laughs and laughs, and I do, too. 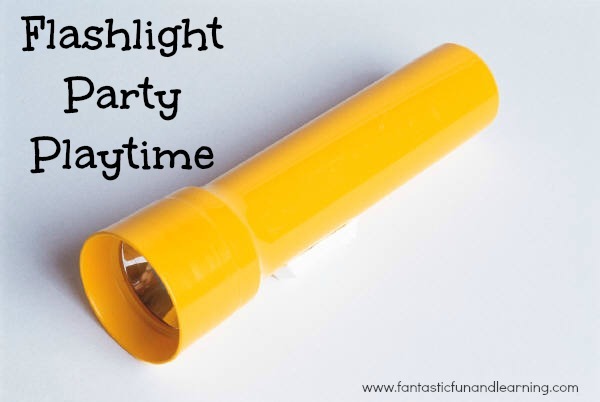 Flashlight parties are our newest playtime ritual. The girls seem to try and pack as much playtime as we can into our evening, because as you can see most of our rituals happen at night as part of our bath and bedtime routine. This flashlight party has become a regular part of our day after everyone is bathed and in pjs. I think I may have accidentally started this one on a day I was tired and had a headache. I needed something a little calm for us to do, so I grabbed our flashlights. We all laid on the floor in the darkest room in our house, and the party began. Who knew it would be so much fun? Over the time we’ve been having our flashlight parties the kids have come up with quite a few different ways to play. Most of the time they just wave the flashlights around the room and experiment with the light. Some days we sing songs (or just strange beats) and make our flashlights dance to the music. Other days we play chase. One person’s flashlight is “it,” and the rest of us chase the light with our own. Some days we call out a shape or direction and we all move our flashlights in circles, triangles, zigzags, etc. There are also a lot more ways to play like including shadow puppets and various learning activities, but so far this has been all child-led so we haven’t tried out any other ideas yet. What are your favorite ways to play with your kids…the easy, low-prep ones that just happen as part of your regular day?